Singer and songwriter Neil Young is not pleased with the Republican Party’s newest Presidential candidate Donald Trump. The real estate mogul came on stage at the kickoff announcement for his campaign on Tuesday with the sounds of Rockin in the Free World, a song written by Young, blaring through the Trump Tower atrium in New York’s midtown Manhattan. There was only one problem with that, Young said Trump did not have his permission to use the song. In a prepared statement, Young said that Donald Trump did not have authorization to use his song in the announcement of his presidential campaign. 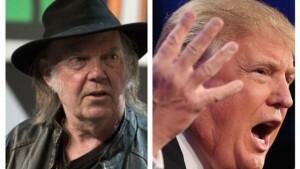 The statement continued by saying that Neil Young was a citizen of Canada and a Bernie Sanders for President supporter. This is not the first time this year a candidate was chastised for using a song by the song’s owner. When Florida Senator Marco Rubio played Something New, the electronic hit at one of his rallies, the duo who wrote the song spoke out immediately, declaring that Rubio did not obtain their permission to use that song and they did not want in any way to be affiliated with one party during the upcoming race for the White House. In similar fashion, during 2012, Mitt Romney played Panic Switch by Silversun Pickups, and the band sent the candidate from the Republican Party a letter of cease and desist. The group’s Brian Aubert declared we do not like when people go behind our backs using music that is not theirs without asking and we do not support the Romney campaign. In addition, there could be big costs associated with the use of a hit song in the promotion of a campaign. In 2008, John McCain, though he was a huge fan of ABBA, gave up on the use of one of their songs at his different campaign events. McCain at that time said it was more difficult to play one of the group’s songs than he had thought. He said it gets to be expensive quickly and if you are not careful, it could alienate certain Swedes.